I have to admit that I am pretty excited about this new version of Punch Out!! coming to the Wii, although I usually steer clear of pretty rehashes of old favorites as I tend to be an old codger who prefers originals. I can't resist this one, though -- I mean, look at King Hippo, Just look at him! The legendary Punch-Out!! is back with a vengeance on Wii, but this time it packs an even bigger punch! Featuring all of the well-known characters from Glass Joe to Von Kaiser, superb duck and weave action, and the addition of enhanced functionality for Wii, the game returns for another assault on Europe on 22 May 2009. After a flawless fight record on the NES and Super NES, Punch-Out!! revives the story of Little Mac as you follow his journey from up-and-coming boxer in the Bronx, NY to undisputed World champion. The game reunites the much-loved mean men of the World Video Boxing Association, who Little Mac must challenge and defeat one-by-one. The truly international line-up of characters includes all the wacky favourites from Von Kaiser, to King Hippo and tireless trainer Doc Louis. 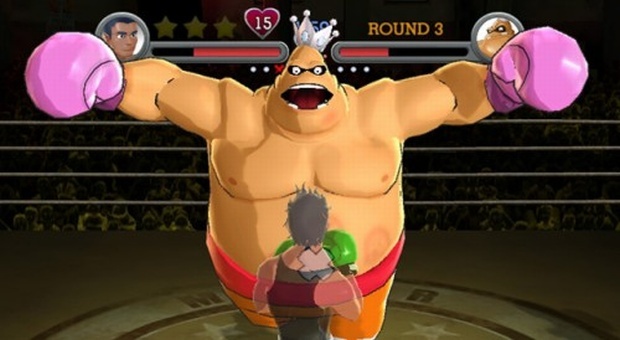 The game brings the tactics and skills of boxing to Wii as you spot weaknesses in your opponent’s armoury – such as changes in their body position – and exploit them with your best upper cuts, hooks and jabs. However, this time the game packs even more power with bold new 3D graphics and the introduction of the motion sensing controls of the Wii Remote and Nunchuk to give a more instinctive boxing experience as you weave, bob and duck your way to the top! Punch-Out!! on Wii offers great new control opportunities, utilising both the Wii Remote and Nunchuk to let you mimic the movements of the left and right hands as you let the leather fly. Meanwhile, the “classic” control system, invites you to use the Wii Remote in a sideways position to simulate the original NES controller and gives the real retro fight feel that Punch-Out!! fans love. Punch-Out!! Will certainly bring the thrills of the big ring to Wii and will give you the chance to experience fight night in the comfort of your own living room. It’s seconds out and time for round one! Get your gloves on and return to the ring – Punch-Out!! is making a comeback! Originally a hit on the Nintendo Entertainment System back when boxers still fought for 15 rounds, the newest installment in the series comes out swinging on Wii. An intuitive control scheme takes you closer to the action in the ring than ever before! Unleash hooks, uppercuts and Star Punches by swinging the Wii Remote and Nunchuk, or flip your controller sideways to enjoy the classic NES control scheme. As big-hearted Bronx brawler Little Mac, you’ll have to launch a one-man assault on the boxing world as you bid to become undisputed champ of the Minor, Major and World ranking organisations. Along the way you’ll lock horns with the likes of Glass Joe, Don Flamenco and the hard-hitting King Hippo. A total of 13 flamboyant fighters stand in your path, every one with a creative new way of trying to make sure you end up face-down on the canvas. Thankfully, Little Mac can fight back. Armed with the Wii Remote and Nunchuk, punching is a simple case of taking a swing at your opponent whilst holding different combinations of buttons. Soften them up with jabs by pressing up on the Nunchuk Control Stick when you punch, or crash home a super-charged Star Punch by holding the C or A Buttons as you let your hands go. Of course, if you intend to master the sweet science you’ll have to learn how to hit and not get hit. Punch-Out!! calls on you to keep a close eye on your opponents and learn their attack patterns – hopefully leaving them swiping at fresh air and open to a crashing counter. If it all sounds like a lot to remember when the leather starts flying, you’ll be glad to know the game features a helpful tutorial mode to make sure you get to grips with the basics before you climb through the ropes. Ultimately, you’ll no doubt want to make sure you’re rightfully recognised as the pound-for-pound king of the ring. Punch-Out!! includes a multiplayer mode that lets you and a friend slug it out to the bitter end. As in the single player mode, you’ll want to land punches at the right moment to build up Star Punch points that translate into almighty haymakers! Landing and dodging blows in Head-to-Head mode also builds up a Giga Mac gauge. Once full, your fighter is ready to inflict some serious damage. Have you always thought you could have been a contender? Then get ready to rumble in the all-action Punch Out!! for Wii. * Fight it out in Career and Exhibition modes or challenge a friend in Head-to-Head mode. * Play using the Wii Remote and Nunchuk for a hard-hitting and immersive experience! * Go retro by holding the Wii Remote sideways like a NES controller and pounding home punches with a simple press of the 1 and 2 Buttons.